First row L-R: Rosemary Brunschwyler Kenney, Betty Callaway Radford, Phyllis Henderson Jones, Margaret Berkey Moorefiled, Agnes Goins Scott, Mary Marshall Brewster, Anna Day Gray, Kathleen Cernak Hill, Margaret Williams Graves, Nancy Pigg Kourl, Katherine Crawford Waldron, and Jessie Mae Akers David. Second row: Pauline Cox Cook, Gwendolyn Austin Brammer, Eugenia Summers Phillips, Lotus Green McKinney, Jane Bearre White, Sona Gillespie Belcher, Loraine Antonacci, Mary Quattro Premo, Birdie Milam Beavers, Mary Basso, and Antoinette Fazio Tolley. 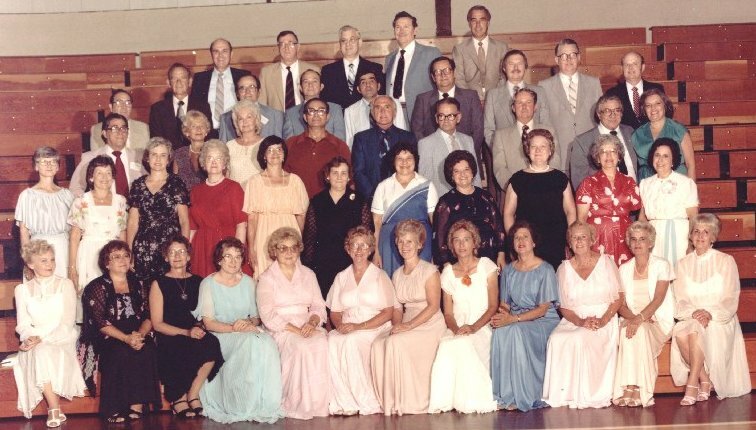 Third row: Tony J. Romeo, Eloise Hardin McKenna, Mary Ann Harrah Lock, Ralph Pack, Winifree Harrah, George Haynes, Raymond Gray, Tony Battlo and Julia Ricci Pennington. Fourth row: James Gianato, Jackie Orrison, Arnold Takach, Richard McPeake, Floyd Hendricks, Harold Shaffer, Cecil Akers, Augustine Signaigo, and Frank Steinke. Fifth row: David Cooke, Joe Peery, Paul Miano, Lewis Bell, and Alfred Perdue. Thanks to Rosemary Brunschwyler Kenney for sharing this picture with us.